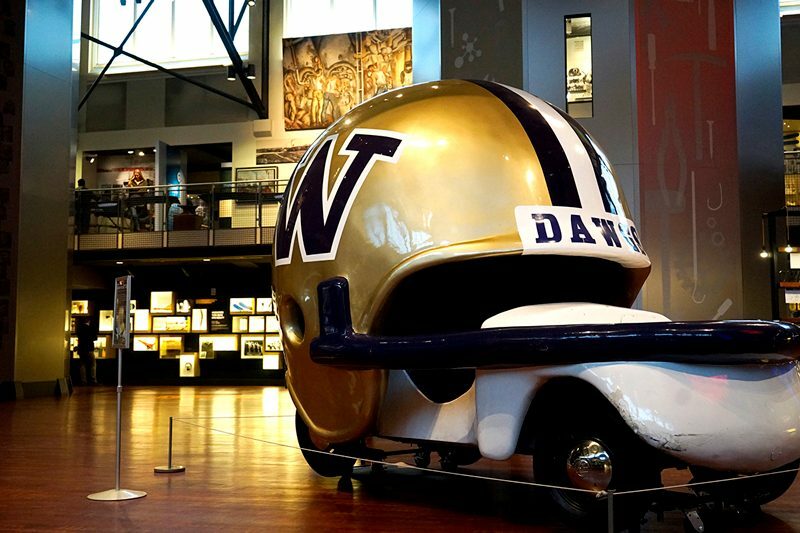 SEATTLE– The legendary University of Washington Husky Helmet car is making a special appearance at MOHAI in time to cheer on the Huskies for their Rose Bowl appearance on New Year’s Day. Visit MOHAI, show your Husky pride, and take your photo with this icon. WHEN: Through January 6, 2019. WHERE: The University of Washington’s Husky Helmet car is located inside the MOHAI entrance at Lake Union Park. DETAILS: Designed in 1977 to celebrate the Huskies’ Rose Bowl appearance that year, it was not allowed to participate in the Rose Bowl parade because it did not meet the required floral display. But the Helmet soon became a beloved feature of every home game and many Seattle parades and celebrations. The Helmet car, which is a converted VW, grew to fame from circling Husky Stadium on the stadium track following every Washington score, with members of the UW band and cheer squad riding in celebration. Husky Stadium’s track was removed in 2013 following its renovation, resulting in a lack of space for the helmet car to run. The Husky Helmet was then donated to MOHAI by University of Washington Athletics and has been preserved by MOHAI as a symbol of UW football history. MOHAI is dedicated to enriching lives through preserving, sharing, and teaching the diverse history of Seattle, the Puget Sound region, and the nation. As the largest private heritage organization in the State of Washington; the museum engages communities through interactive exhibits, online resources, and award-winning public and youth education programs. For more information about MOHAI, please visit mohai.org, or call (206) 324-1126. Facebook: facebook.com/seattlehistory Twitter: @MOHAI. Image credit: Husky Helmet Car, University of Washington Athletic Department; image by PeiPei Sung.